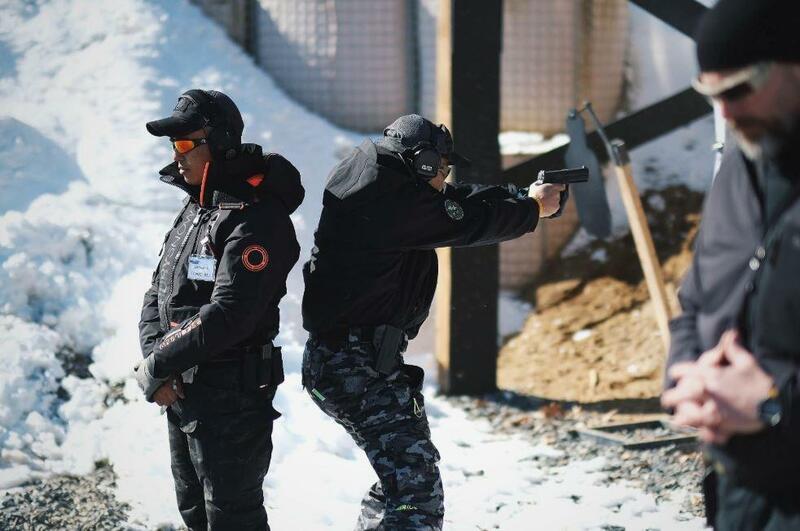 This photo, posted to Facebook by Torsak Sukvimol, was taken during a training in Epping for members of the Royal Thai Police. The guns will be manufactured in New Hampshire, where SIG Sauer has rapidly expanded its operations in recent years. That growth is fueled by deals with the U.S. Army and domestic law enforcement agencies, as well as lucrative contracts with police and military forces in 80 countries. Those international deals have turned SIG Sauer, which is owned by a German conglomerate, into the U.S.’s largest exporter of small arms. 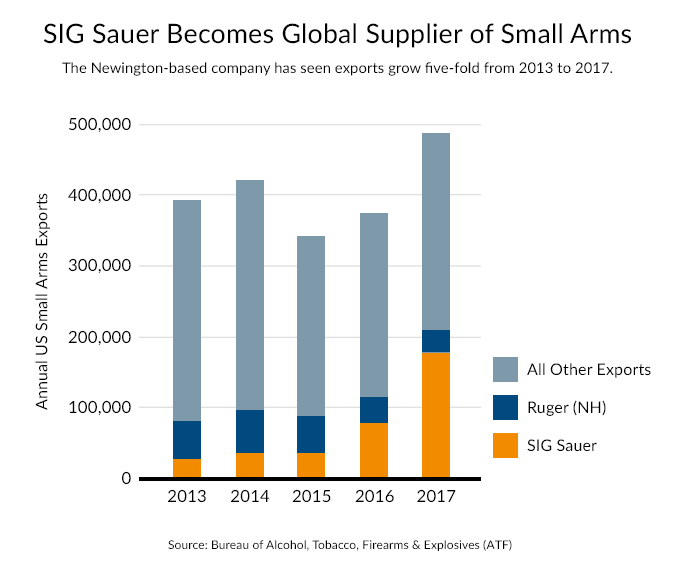 In 2017, SIG Sauer shipped more than 179,000 pistols and rifles around the globe, accounting for more than one-third of all firearms exports, according to ATF statistics. Now, a proposed regulatory change backed by the Trump administration could push SIG Sauer’s export business even higher, and mean millions of dollars more in international sales. The change would also be good news for another major New Hampshire-based weapons maker, Sturm Ruger, which exported 30,000 rifles and revolvers in 2017. 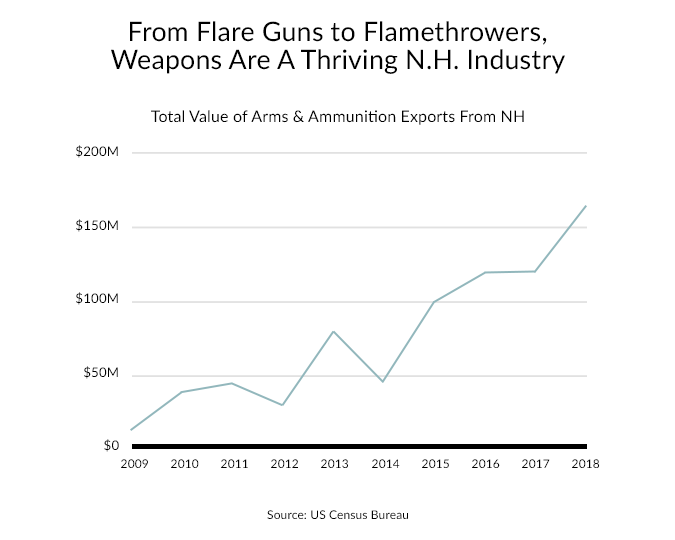 The two companies have helped turn New Hampshire into the 12th largest exporter of weapons and ammunition the country, and the largest in the northeast. But critics of the rule proposal say it will result in additional U.S.-made weapons ending up in the wrong hands. Under the current regulatory system, domestic gun manufacturers must receive State Department approval to export small arms, including pistols, semi-automatic rifles and revolvers. The firearms industry is backing a plan that would shift the licensing process to the U.S. Commerce Department, a move that would benefit gun makers in two key ways. 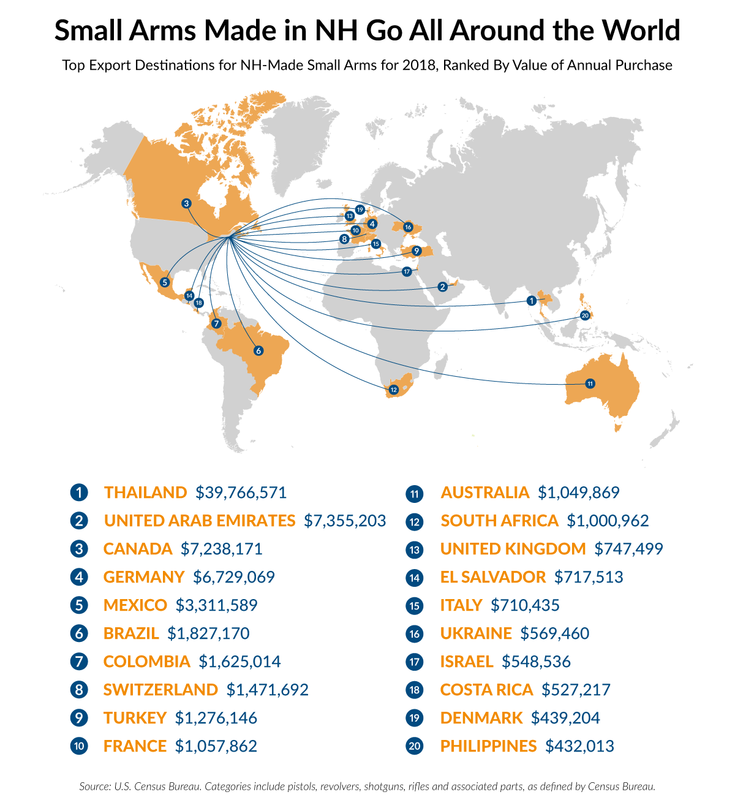 First, companies looking to export would no longer need to pay registration fees to the State Department. More importantly, the new policy would scrap a provision that requires Congressional notification of any small arms deal worth more than $1 million. The industry says that additional oversight process can drag on, making it harder for companies to compete for time-sensitive contracts. “So what happens is U.S. companies can’t bid on these contracts, and we lose the sales and it hurts the ability of companies like Ruger and SIG Sauer to grow their businesses and create more jobs--good paying jobs--in New Hampshire,” said Lawrence Keane, general counsel for the National Shooting Sports Foundation, which represents firearms makers. SIG Sauer didn’t respond to a request for comment about how the new rules may impact their export sales. Neither did Ruger, which operates a factory in Newport and exported more than 26,000 rifles in 2017. In spite of industry frustration with the current regulatory system, SIG Sauer has seen its firearms exports grow by more than 500 percent in the past five years. Export data released by the U.S. Census Bureau show that $83 million worth of New Hampshire-made pistols, rifles, shotguns, revolvers and associated parts--were delivered around the globe in 2018. That includes nearly $40 million worth of small arms shipped to Thailand, and another $7 million delivered to United Arab Emirates. The questionable human rights records of these and other customers of U.S.-made arms have provided grist for critics who want to crack down on foreign sales. Lindsay-Poland, who operates the Stop U.S. Arms To Mexico project, says U.S.-made weapons imported into Mexico are fueling that nation’s violence, and ultimately end up in the hands of violent actors. Though most international sales happen with little public notice, Congress did raise alarm in 2017 about a proposed SIG Sauer contract with Turkey. That concern came in response to a video showing Turkish security forces attacking protestors during a visit by President Recep Tayyip Erdogan to Washington D.C. At the time, SIG Sauer was seeking approval for a $1.2 million contract with those same security forces. The company reportedly pulled its request for an export license later that year. Export data shows approximately $1.2 million worth of pistols and parts were shipped from New Hampshire to Turkey in 2018, though it isn’t clear who is responsible for that transaction. In recent months, Congressional Democrats have voiced opposition to the proposed export rule change. That culminated in a hearing last week by the House Foreign Affairs Committee, where Democrats, including Rep. Tom Malinowski from New Jersey, argued that semi-automatic rifles and pistols should continue to be regulated under the same rules as weapons of war. “Violence against civilians around the world, mass violence by militias, by criminal terrorist organizations, by rapacious abuse of governments, is not committed by aircraft carriers. It’s not committed by boats, largely not by planes, or tanks or by howitzers or mortars. It’s committed by small arms,” said Malinowski, who previously worked for the State Department. Democrats contend that shifting oversight to the Commerce Department will weaken the input of State Department officials who have better on-the-ground knowledge of potential destabilizing factors in the foreign countries where U.S. weapons are headed. But Republican backers of the new regulations point out that the State Department, as well as a range of national security agencies, will remain involved in small arms export licensing under the Commerce Department. Many Republicans also criticize what they see as a political about-face on the issue: the proposed rules were first developed by the Obama Administration as part of a broader overhaul of the county’s export policies. The small arms rule was never released for comment, however, following the mass shooting at Sandy Hook Elementary School in 2012. “I’m disappointed that this common sense good government and bipartisan, or should I say once-bipartisan issue, has been politicized and our domestic industries will continue to be unduly over-regulated until the government takes action,” said Rep. Scott Perry, a Republican from Pennsylvania, during the House hearing. Democrats have rolled out legislation that would reverse the proposed rule change, but it is unlikely that any measure would pass the GOP-held Senate or survive a likely veto by President Trump. Despite the likelihood of the new policy taking effect, there’s debate as to how large of a financial boost they may give gun makers. Jurgen Brauer with the research group Small Arms Analytics says with exports making up just a fraction of the overall firearms manufacturing industry, the streamlined rules could amount to just a one or two percent increase in overall sales. Still, that bump would be welcomed by an industry that has seen slumping sales in the U.S.